Amphetamine is a prescription stimulant commonly used to treat Attention-deficit hyperactivity disorder (ADHD) in adults and children. It is also used to treat symptoms of traumatic brain injury and the daytime drowsiness symptoms of narcolepsy and chronic fatigue syndrome. Initially it was more popularly used to diminish the appetite and to control weight. 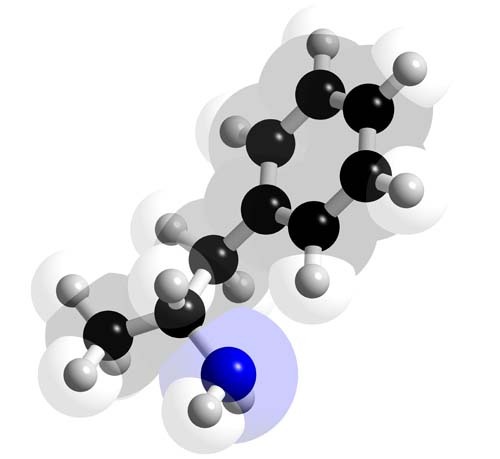 Amphetamine, both as d-amphetamine (dextroamphetamine) and l-amphetamine (or a racemic mixture of the two isomers), is believed to exert its effects by binding to the monoamine transporters and increasing extracellular levels of the biogenic amines dopamine, norepinephrine (noradrenaline) and serotonin. It is hypothesized that d-amphetamine acts primarily on the dopaminergic systems, while l-amphetamine is comparatively norepinephrinergic. Amphetamine was first synthesized in 1887 by Lazar Edeleanu at the University of Berlin. He called the compound "phenylisopropylamine". It was one of a series of compounds related to the plant derivative Ephedrine, which had been purified two years previously by Nagayoshi Nagai. No pharmacological use was found for amphetamine until 1927, when pioneer psychopharmacologist Gordon Alles resynthesized it. Alles was part of a group of researchers looking for an ephedrine substitute. It was then introduced in most of the world in the form of the pharmaceutical Benzedrine. This drug was used by the militaries of several nations, especially the air forces, to fight fatigue and increase alertness among servicemen. The German military was notorious for their use of methamphetamine (a derivative) in World War Two. After decades of reported abuse, the FDA banned Benzedrine inhalers, and limited amphetamines to prescription use in 1959, but illegal use became common. In the United Kingdom, amphetamines were regarded as Class B drugs and the derivative Methamphetamine has recently been reclassified to Class A. In the United States, amphetamine and methamphetamine are Schedule II drugs. Because of the abuse of amphetamines in the U.S., most brands were discontinued by the 90's including the highly abused brand names such as Biphetamine (known as black beauties), and Preludin known on the street as Bams, which the coating was peeled and then injected. Only a few brands of amphetamines are still produced in the United States which are prescribed for narcolepsy, hyperactivity in children, or for extreme obesity. Tolerance is developed rapidly in amphetamine abuse, therefore increasing the amount of the drug that is needed to satisfy the addiction. Many abusers will repeat the amphetamine cycle by taking more of the drug during the withdrawal. This leads to a very dangerous cycle and may involve the use of other drugs to get over the withdrawal process. Chronic abusers of amphetamines typically snort or resort to drug injection to experience the full effects of the drug in a faster and more intense way, with the added risks of infection, vein damage and higher risk of overdose.